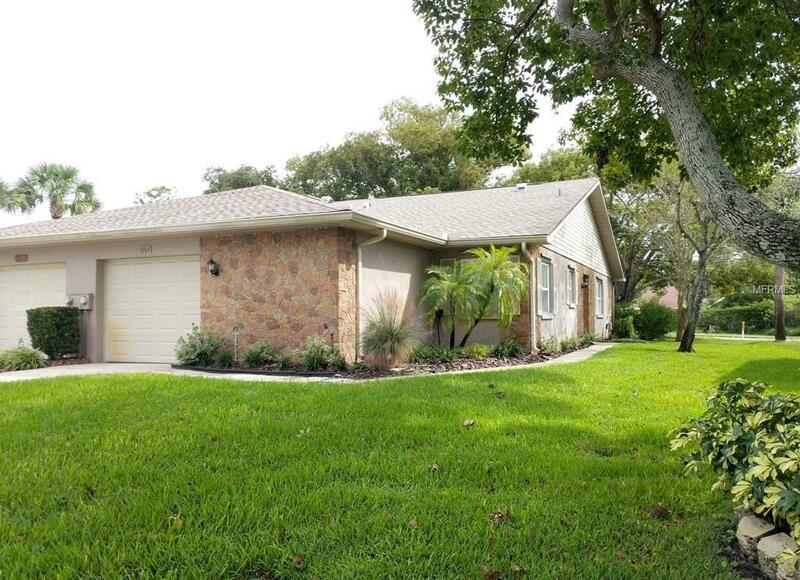 New Value Price-Light & Bright Villa located in Duplex Village II of Highland Lakes. Your very small pet is welcome here. Yes, this villa backs to Lake St. George Dr., Isnt it great the newer double pane windows insulate the villa from the activity? This Villa offers over 1300 Sq Ft of Living with 2 bedrooms & 2 baths. The Hartford model is a split plan offering an entry foyer w/storage closet, large living room, separate dining, an eat-in Kitchen with fabulous work space and a window at the prep area. Near the kitchen is the laundry closet w/ full size Washer & dryer. There is ample storage throughout. The master suite has 2 wall closets, a linen closet, a single vanity dressing area & private bath with walk-in shower. The1 car oversized garage, offers enough space for a golf cart and workshop, this villa has a 1 Car Door opening. An Open back patio invites you to enjoy the more fabulous weather days of Florida. Roof is 2008, AC system 2012. Duplex Village II fees of $90/mo. cover Lawn care & pest control, basic Cable, Irrigation, trash pick-up. Ownership is automatic membership to Highland Lakes' amenities. The monthly HOA fee of $98 includes Golf Membership for 2 & No Greens Fees on 3-9 Hole Golf Courses with $10 guest rounds; 2 Community Pools, 4 Tennis/Pickleball courts, Clubhouse, Lake Lodge, Boat Access to Lake Tarpon; Performing Arts, Shuffleboard, RV & Boat Storage, Auditorium, Arts & Crafts and much more. It's An Active 55+ community. Additional Lease Restrictions Occupant Must Be 55+; Register With The Duplex Village II Board.